Former children’s ski champion Ed Stephens had one dream after his accident – to get back on the slopes again. Thanks to National Star College and almost three years’ hard work, Ed’s dream came true. 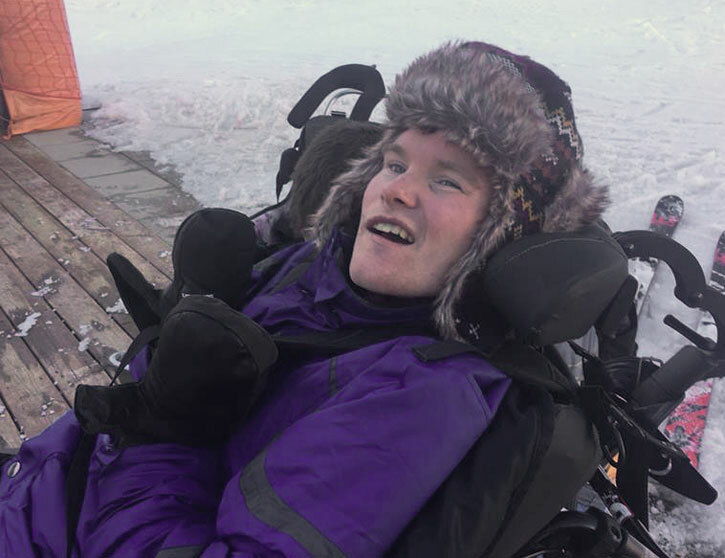 The 24-year-old took to the slopes with a specially-adapted sit ski which he controlled with a switch he activated by moving his head from left to right. In 2007 Ed was crowned British Children’s Champion in Super Giant Slalom. He was 14 years old and beat 100 rivals at the British Championships in Meribel, France, winning by 0.55 seconds. Ed who started skiing as a child with his family, wanted to start racing at the age of 12. He joined the British Ski Academy and represented Great Britain in international competitions. Video: Sit Ski, a feature on skiing for disabled people in Arinsal, Andorra for BBC Breakfast with Mike Bushell. from homeonfilm.com on Vimeo. The following season Ed went to the newly-formed Ambition Racing Team, under the stewardship of Marc Telling where he continued to find the podium at the English and Welsh Championships also competing in Junior FIS races all over Europe. Ed was approached to join Snowsport GB Youth Team. Soon after and whilst taking his GCSEs, Ed was suffering with Glandular Fever, which shattered his fitness levels and Ed decided to quit skiing to focus on life outside of ski racing. By the time he was 19, Ed was ready to return to the slopes. But it never happened. A car accident and further medical complications in 2013 left Ed with a brain injury and complex disabilities. When Ed arrived at National Star in Cheltenham, a specialist further education college for young people with complex disabilities, he had very limited movement and could not speak. The National Star team of experts including physiotherapists, occupational therapists and speech and language therapists have worked closely with Ed. Now he has more strength in his neck and head which means he can use a switch to control a communication device. That strength is also helping him to speak again. But through it all Ed had one objective. ‘One of the things Ed wanted was to get back on the slopes. For him and his family this is a big milestone in his recovery.’ said Verity Fisher, Head of Physiotherapy at National Star. Physiotherapists and occupational therapists worked with Ed to improve his head control and core strength. In classes Ed used a virtual reality headset to get a feeling of what it would be like back on the slope. He is one of 20 National Star students who went to Andorra for the ski trip. ‘For every student on this trip it is about facing new challenges and putting all the life skills they have learned in class to use in a real situation,’ said Ms Fisher.